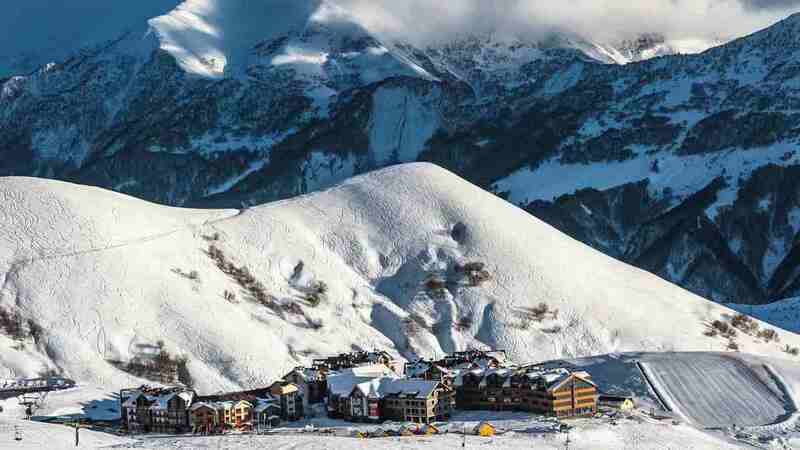 Your Tbilisi guide and driver will meet you at 8 am at the lobby of your Hotel to take you to the one day long winter tour to the most famous Georgia ski resort town Gudauri. The road to the Gudauri follows the so-called Georgian Military Highway and takes about 2 hours. Along the way, you will have a short stop at the magnificent Ananuri fortress, the Dukes of the region, known as Eristavi family, ancient residency; as well as in the village Pasanauri at the place where two small mountain rivers (black and white) form a bigger river called Aragvi. The Gudauri town itself located couple of kilometers before one of the highest road-points in the Caucasus – the Cross Pass at about 2000 meters above the sea level. After taking the cable car up the hill an unforgettable and gorgeous view on the snowy Caucasus mountains will open right in front of you. As an option, you can rent a ski, or a snowboard and other equipment to spend a wonderful winter day like it should be spent – enjoying snow and mountains in Georgia. Depart back to Tbilisi at 4:30 pm.